For this week's handbag chit chat, I wanted to share a few ways to style an orange bag. As mentioned previously, I was very skeptical about purchasing an orange bag especially something that is so expensive. Thanks to my husband who convinced me that I should go for it. I took it out a couple of times for date nights and am intrigued by the versatility of orange. 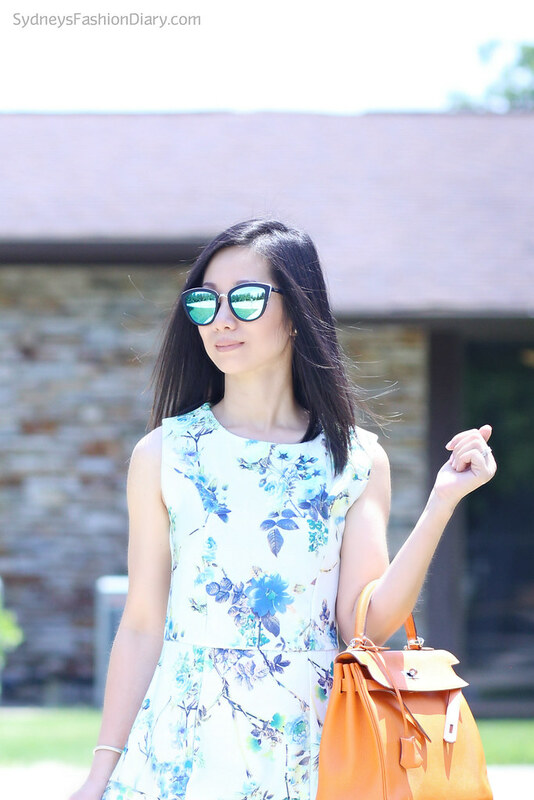 For the first outfit, I paired the bag with my green/blue dress. Since blue and green are two orange's complimentary colors, they look great together. Complimentary colors are colors that are directly across from each other on the color wheel. If you're not comfortable wearing colors, a neutral outfit is always a safe option. For the second look, I paired my orange bag with a simple black and white outfit. I love love love this rompers. A warm tan/beige with bright orange is another safe combination. If you're feeling a bit daring, try to pair orange with a purple to create a bold look (I might try that next). I can't wait to pair my orange bag with leopard prints in the Fall. For everyday wear, an orange bag will go beautifully with a pair of denim jeans and a simple white tee. The possibilities are truly endless. Orange is such a happy color and it just makes me smile. Glad hubby convinced you because you totally bring out the beauty in it! Adore your looks! Another great bag to add to your beautiful collection!Have a wonderful blessed weekend!